What Next for Health and Safety?Thursday 20th September 7:30pm at Bread & Roses Clapham. on the Tower Crane Register (crane MOT) & the Hard Hat Regulation has resulted in the HSE Board recommending that they be scrapped despite protests from ourselves, a low response and evidently a 50:50 split on the board. on removing/revising 15 ACOPs including the ACOP which goes with the Management of Health & Safety at Work Regulations (Risk Assessment, Young Workers, New or Expectant Mothers, Temporary Workers) closed on 14th September. Removing some self-employed from the scope of health & safety legislation closes on 28th October. What is proposed goes way further than the deregulation of safety in the Thatcher years – & with the Hillsborough independent report published this week, we have just had a powerful reminder of what lax health & safety means. We are going to shortly see the effects of 35% cuts to HSE budgets and further decreases in the level of inspections and to cap it all it is possible there will not be a prosecution of Falcon Cranes over the Battersea Collapse at Thessaly Road 2006 – Lilliana will give an update. Please make an effort to attend the meeting to help us plan a campaign. 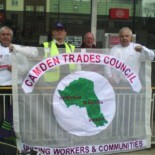 This entry was posted on September 18, 2012 by CAMDEN TRADES COUNCIL.